Baby cereals are considered an essential first food over the last couple of generations and parents who used them over the years to feed their babies swear to its goodness and convenience. ​Is Cereal Good for Babies? Commercial baby cereals are iron-fortified which is good for breastfed babies. Iron from breast milk naturally decreases at around six months of age when the stored iron on babies which is passed on from the mother during pregnancy also becomes limited. It is cheap and convenient. Storage is safe and is easy to mix with water, breast milk or infant formula which is already a familiar flavor for your baby. It is easy to digest. For decades, cereals have usually been the first food most parents feed their babies, and they are proven to be well tolerated, rarely causing an allergic reaction. It is nutritious. Aside from iron, some essential vitamins and minerals are also added to help babies obtain their rapid growth. ​If your baby is already starting to eat solids, you can also start giving him cereals. As a matter of fact, you may give him the best baby cereal as his first solid food. ​So when would you start giving solid foods? ​Your doctor may say any time around 4 to 6 months as long as your baby indicates readiness. ​And how would you know if your little one is ready? Can sit upright and hold up his head with minimal support. Have or almost doubled his birth weight. Seems interested in mealtime, may try to grab food and put in his mouth. Has mastered oral skills of moving and swallowing food. If your baby manifests those mentioned above, then you may consider giving him his first taste of solids, eventually letting him try the best baby cereal in the market. Remember that each baby is different, so starting with solids will vary. ​Usually, it is often hard to get kids to eat. But cereals are well liked by most kids. With introductions of new flavors and healthy ingredients, your kids will surely love, as well as the nutrients that support their body needs. ​What you feed your baby on early age may determine his healthy lifestyle in the future. So it is important to choose wisely especially when the health of your child is on the line. ​The best baby cereal should have all the required nutrients needed by the baby in right amount with minimum to no preservatives or additives. Keep an eye on added sugar. ​Most cereals are whole or refined grains of rice, barley, and oats. Traditionally, rice cereal is usually the first food of choice because it is easily digestible and is considered low-allergy but also, many prefer oats for the same benefits. ​There are some controversies over gluten content in wheat, barley, and some oat cereals in regards to gluten-related diseases, as well as babies developing a wheat allergy. Studies show that eating it may help for the prevention of allergy. It might be an issue you might want your doctor to discuss. Since there are varieties of grains to choose from, it is best to feed your baby one grain two to three days before trying a new one. It is because you might want to keep an eye for signs of allergies like rashes, hives, breathing problems, vomiting, and diarrhea. If you suspect a food allergy, call your child’s doctor right away. Should iron supplements be needed as advised by your baby’s doctor, then infant cereal may be your best choice. Check the label for iron nutrient content. Commercial baby cereals may be slammed or sensationalized by some blogs on some issues like how is it processed or what is it made of, without any reliable evidence. As a parent, it is your decision to whether or not to avoid these baby products. Sometimes it is better to trust your instincts. As there is a broad range of infant cereals available in the market, we select for you some products which we thoroughly researched and reviewed to make sure your babies gets the best. With the brand known for its baby nutrition packed jars, Gerber’s Organic Single Grain Oatmeal Cereal is true to its name. The single-grain ingredient is found to be more beneficial for preventing hypersensitivity reactions to a certain food ingredient. Oats are known for its excellent nutritional value. Some of the nutrients it has are iron with a daily 45% per serving which is essential for your child’s brain and learning ability and also Vitamin C, 6 B, and Calcium for his overall growth and development. It is USDA organic certified and is non-GMO which means it doesn’t have genetically engineered ingredients. An excellent choice if you are particularly concerned about any chemicals that will potentially harm your baby. It is relatively cheaper than any other cereal and comes in a less-mess package. It has a good taste and texture and is easy to digest which is great for babies with digestive problems. You can mix it with water, breast milk or infant formula. For Toddlers, you can enhance its taste by adding puree. The product label will tell you more on how is it prepared. 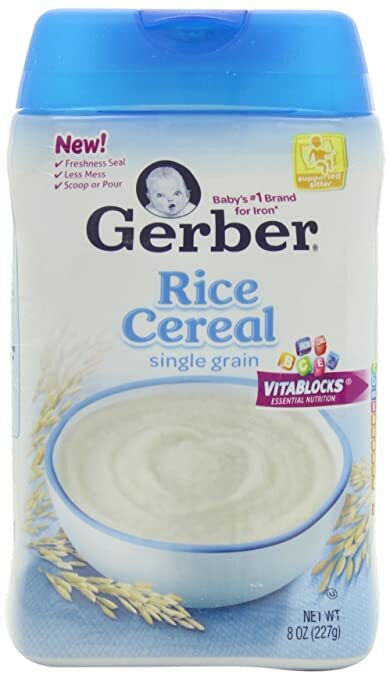 If your baby cannot tolerate other cereals, this Gerber Single-Grain Rice Baby Cereal is a perfect choice. It has a specially formulated nutrient blend Vitablocks which is essential for your baby’s nutrition absorption. It is also a great source of iron, calcium, Zinc, Vitamins C, E and 6 B for your baby’s healthy growth development. If you are looking for a natural baby cereal, then it is an excellent choice since it has no artificial colors and flavors. And it is USDA Approved and is non-GMO. The package is designed for a less-mess food preparation. Since it has a natural flavor, you can enhance the bland taste by mixing it with milk or purees. Check the label for proper preparation. It has a natural flavor and color. If your toddler can tolerate wheat, then this Nestle Cerelac Wheat with Milk Cereal is a delicious and nutritious choice. Many kids like it for its great taste and consistency. It also contains probiotics which are good for babies with digestion problems. It is also packed with DHA and all essential nutrients your baby needs for overall development and has been used by parents to feed their children for years now. And because it already contains milk powder and is a little sweet, you can just add water. This Happy Baby Organic Probiotic Multi-Grain Cereal is a combination of oats, amaranth, and quinoa and is packed with essential nutrients DHA and Choline. DHA is a fatty acid needed for the proper structuring of the brain and its cognitive function such as memory and learning. Choline which helps in maintaining normal brain development is important for babies muscle and nerve function and healthy metabolism. It also has probiotics that help in facilitating a good digestive system. A certified USDA organic product and non-GMO, this baby cereal is one of your options for the best baby cereals. If rice doesn’t suit your kid, this NurturMe Protein Packed Quinoa Organic Infant Cereal is the healthy alternative. Quinoa is known for its amazing health benefits with a high protein content, fortified with natural iron and other essential nutritional benefits. It also has plant-based natural nutrients added to its organic ingredients.It has fibers to aid proper digestion thus preventing constipation. Its probiotics support healthy digestive & immune systems. This cereal is rated as one of the best organic baby food for a lower price. Since quinoa is not a familiar flavor, it may be hard for babies to like the taste but some mixing will do. Choosing the best baby cereal is a little bit confusing as it involves your baby’s overall health. We compiled the list above as shortest as possible to be able for you to narrow your options. Assured that all the products on the list are safe and beneficial, the only worry you have is if your baby will like what you offer. The best way to check is to taste it yourself. Mix it with breast milk or formula that is familiar taste to your baby. Babies are usually picky and challenging to get to eat that is why we are choosing Nestle Cerelac Wheat with Milk Cereal as our top pick as this is the best-tasting baby cereal on the list. Your baby will surely eat this without hesitation. Aside from the great taste, it is also nutritious and is easy to digest. But you might already know that it is not only the taste that is the basis in choosing the best food for your little one. It is still up to your preference and priorities. As parents, we only want the best for our babies and they deserve nothing less.